I recently hosted a family game night at my house with my sister, brother, brother’s girlfriend, mom, and mom’s “friend” as Lilu likes to say while making exaggerated finger quotes. I thought for sure that this would provide ample material for an upcoming blog post, but the evening was surprisingly uneventful. However, mom and her “friend” are fans of my Soccer Mom Sommelier feature, so they brought a couple bottles of wine to try. They instructed the wine salesman at a local specialty shop to recommend his favorite red and white under $15 a bottle. Out of the two, the white was more to my liking, and a definite departure from my last two reviews, so I thought it would be a good one to share. Last week’s Pinot Noir (MacMurray Estate Vineyards) and the week prior’s Chenin Blanc/Viognier (Pine Ridge) were both made in California. As is common with American (especially Californian) wines, they were full of bold flavor. 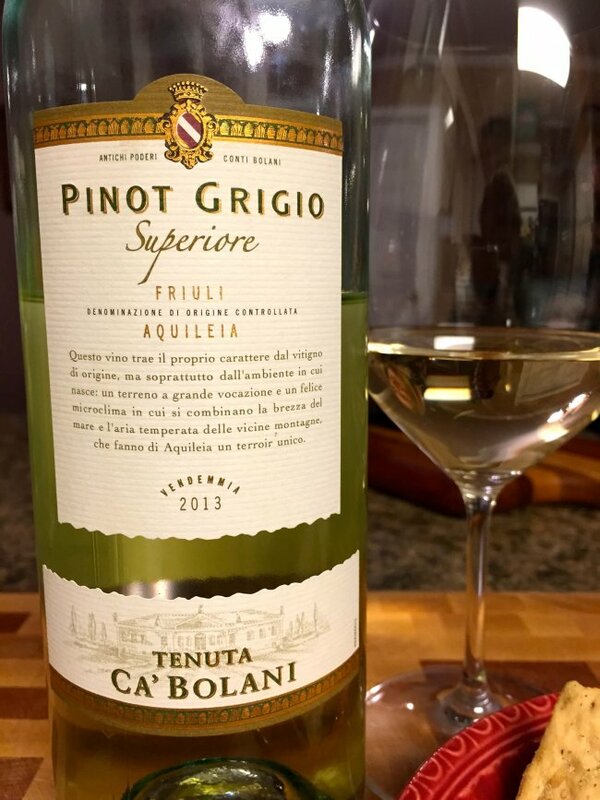 Tonight’s pick, a 2013 bottling of Tenuta Ca’Bolani Pinot Grigio from Italy could not be more different, and provides a great lead-in for my first official Soccer Mom Sommelier “wine lesson”—Old World vs. New World. When it comes to wines, it is easy to remember Old World and New World, as they are divided much like history. Old World is Europe, including all the traditional wine countries (France, Italy, Spain, Germany). The New World is North and South America and Australia, and basically anywhere else outside of Europe. New World wines, like I touched upon at the beginning of this entry, will likely be BOLD and in-your-face. Up and coming winemakers wanted to make sure that their offerings got attention when first entering the market. New world wines are generally very fruit forward and many make liberal use of American oak which is more intense than European breeds— you can literally taste the wood! Old World wines are known for being subdued and nuanced in their palate. If there is oak used, it is usually aged and/or French barrels for a subtle effect. Fruit is not as prominent, and there are often strong earthy or mineral notes. So the gist of it is, if you like bold, fruity, and/or oaky wines, go for New World. If you prefer subtle and earthy, choose a classic Old World style. This Pinot Grigio from Italy is a great example of an Old World white. When tasting (my whole family enthusiastically offered their input as well), it was difficult to pick out more than just a few specific fruits. The alcohol content is on the high end for white wine at 13% (bonus! ), but it is very light on the mouth and would pair well with a wide variety of foods. Or you can drink on its own, as we did during an intense game of Boggle! And so concludes my first wine lesson— you’ve now learned one of the most basic ways of distinguishing wines, or you already knew that (heck you could be more knowledgeable than me) and simply found a new bottle to add to your list of ones to try. Whatever the case, what I want to emphasize most is that learning is FUN—especially when there is wine involved! Cheers!